Jack Brooks is hoping for a decent run in Yorkshire’s Vitality Blast team in order to prove he shouldn’t be pigeon-holed as just a red ball specialist. Thursday’s outing in the win over Durham Jets at Emerald Headingley was Brooks’s first T20 appearance since mid-June 2015, and he impressed with 3-21 from four overs. Brooks, 34, played again in Sunday’s defeat to last year’s runners-up Birmingham Bears at Edgbaston without striking. 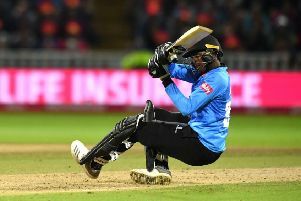 However, he is confident there are more good things to come, having taken a T20 five-for in his first season at Yorkshire in 2013 and gained second-string international recognition with England in one-day cricket. “My last appearance was around three years ago, I can’t remember exactly when,” he said. “I’ve certainly not played anything in the last two seasons having been injured and rested due to the scheduling, and it’s been really frustrating. “I don’t see myself as just a red ball bowler, and you kind of get pigeon-holed once you miss a little bit. It was nice to come back in and bowl well in the first game last week, get some wickets and remind people what I’m capable of. I’ve been involved in England Lions squads, so it’s not as if I’ve never bowled with a white ball before. “I back my skills. It’s just that my red ball skills have been really good for the last few years, and I was rested for a few white ball games on the back of that. Brooks is two appearances away from the 50-mark in his T20 career and nine wickets away from the same milestone. The former could realistically come in Sunday’s trip to face Worcestershire at New Road. “It’s been difficult to do real quality practice because of the scheduling, but the last few weeks and coming into this season I’ve put more emphasis on my white ball skills. “I always back myself when I’m in good form. “When I started at Northants, I didn’t really see it as any pressure. It was a win-win situation, and I could just try and make a name for myself. Yorkshire were due to play on Wednesday against Derbyshire at Emerald Headingley, but it has now been re-arranged for July 30 (6.30pm) to avoid a clash with England’s football World Cup semi-final against Croatia. Their next fixture is now Durham at Emirates Riverside on Friday, also a 6.30pm start.